Good news for all players who are looking for a new game world located in South America. 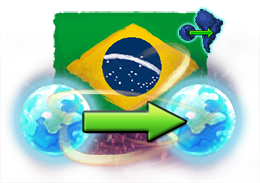 Next week, we will launch an Optional PvP game world in South America: Celebra will start with no initial transfer or premium-only restrictions. Same as Kalibra and Gentebra, the new game world will be protected by BattlEye and allows players to transfer their characters from older game worlds which were not initially protected by BattlEye too. We plan to launch Celebra in the course of the day on Monday, October 29. Enjoy the new game world!